Sterile areas in pharmaceuticals where the sterile product is exposed to air are considered as critical area and other adjacent area are known as non-critical areas. Appropriate design, positioning and use of critical and non-critical areas in the pharmaceutical manufacturing process are among the key prerequisites for success in this industry. Critical areas include all areas in which any kind of sterile product (including both drugs and equipment) must be exposed to the sterile environment and where activities including sterilization, sterile filling and closing take place. Aseptic preparation and support rooms are also critical areas. All other areas in the manufacturing process are considered the non-critical areas. A well-designed flow of the work process which avoids critical and non-critical areas mixing must ensure avoiding contamination of any kind. Additionally, pharmaceutical industry laboratories require extremely high levels of air exchange. These and many other parameters, standards and procedures ensure that the sterile products remain sterile prior to, during and after the manufacturing process. The first stage in this process requires a planning of the manufacturing facility. Regardless of the protective measures taken during the manufacturing process itself, an inadequate architectural design of the facility itself will lead to an increased risk of contamination. Guidelines for architects and engineers include strategic planning of vicinity, direct connectivity, crossing (including both materials and personnel crossing), vertical and horizontal communications between critical and non-critical zones. This is especially applicable to complete separation of the clean areas from eating zones and restrooms in any GMP manufacturing facility. It is important to position the corridors along the supporting rooms instead of the clean rooms, as crossing between the critical area personnel and non-critical area personnel is minimized in this way. Furthermore, the air shafts between these two types of areas must comply with the following rule: air shafts should be designed in a way that pushes the air from the clean zones to the less clean zones and never vice versa. If clean and unclean areas are adjacent to each other, the risk of contamination is avoided by providing the pressure difference between the zones. Experts advise that the pressure difference should be at least 12 Pa. Alarm system ensuring the pressure difference levels is highly advised as well. 20 air changes/hours is the current standard for supporting rooms. Temperature control systems, as well as humidity control systems, are inseparable parts of quality control in pharmaceutical industry. The number of staff operating in the clean areas should be minimized. More importantly, the staff mobility and terms of entering the critical areas must be specified and limited. Automation and robotics offer significant improvements regarding this issue. 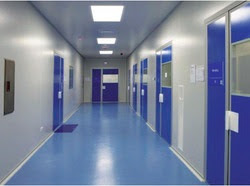 Building materials used in clean rooms must be chosen on basis of ease of cleaning. Wall to floor junctions and wall to ceiling junctions must be seamless. The ceilings should be sealed. Furthermore, ergonomic design of both the facility critical zones and the equipment in relation to the dimensions of the cleanroom play a significant role in avoiding any possibility of contamination of sterile products. Additionally, ergonomics enable easier equipment handling by the staff and easier sanitation process.